From mineral springs to mud baths, these are Australia’s best natural spa baths to put on your weekend bucket list, says Mandy McKeesick. Peninsula Hot Springs, Mornington Peninsula, Voted the Best Luxury Spa’ in the 2014 World Luxury Hotels Awards. This lovely little retreat in Victoria is the real deal, having been voted ‘Best Luxury Mineral Spa’ in the 2014 World Luxury Hotel Awards. By all accounts, however, Peninsula Hot Springs – found on Victoria’s physically-blessed Mornington Peninsula – is something of a stand-out experience, located on a 17-hectare property offering not one, but 20 different styles of relaxation, including thermal mineral spring pools, an underground sauna, private outdoor baths, cave pools, Turkish steam baths and this verrrrry nice looking hilltop retreat. Entry from $35 per adult. Within a bough-lined enclosure, add this region’s mineral-rich, skin-conditioning mud to hot water and slip into a bath just big enough for two. Listen to the gidgee fire crackling nearby as you sip on sticky date wine and relax under a velvet canvas of stars at Eulo. $65 per person. Bitter Springs, Elsey National Park, NT (photo: Let’s Go Travel Australia). The Katherine region is famous for its thermal pools but Bitter Springs, in Elsey National Park, is an area barely touched by man. Snorkel to observe the turtles as you drift with the current in the ethereal teal waters of this palm-fringed waterhole. Free entry. This Japanese-inspired bathhouse heats local spring waters for use in its treatments, but this does not detract from the natural experience. The indoor and outdoor hot pools are complemented by herbal steams, massages, facials and a Japanese-style teahouse. $60 per person. Beware – these springs are so hot, rumour has it you can cook a chook in the hottest parts of Nettle Creek! You can burrow into the soft sands of the creek or pull up the caravan at the Innot Springs Leisure and Health Park, where several man-made pools have a regulated temperature. Free at Nettle Creek; from $27 a night at Leisure and Health Park. Stand on a wooden platform in Witjira National Park on the edge of the Simpson Desert and dive into the 36 degrees of bliss that is the long natural oasis of Dalhousie. The springs here are steeped in Aboriginal history and support unique aquatic life, including the strangely-named Lake Eyre hardy-head fish. Culture, ecology and location make this a must-do natural spa experience. $10 per vehicle. Waters from Australia’s Great Artesian Basin have long been cherished for their health and healing benefits and the recently renovated Moree Artesian Aquatic Complex is the mecca for hot tub enthusiasts. With a range of pools at differing temperatures and a fantastic warm-water playground for kids (more hygienic than it sounds, we promise), this is one for all the family. $8 per adult; $25 per family. Clayton is a working cattle station at the end of the Birdsville Track, so chances are you’re going to get grubby before you soak. But when you’re sitting in a cattle-trough, plonked in a paddock, with fresh-from-the-ground hot artesian water massaging tired muscles and the sunset colouring the sky, you won’t want to be anywhere else. $10 per vehicle. 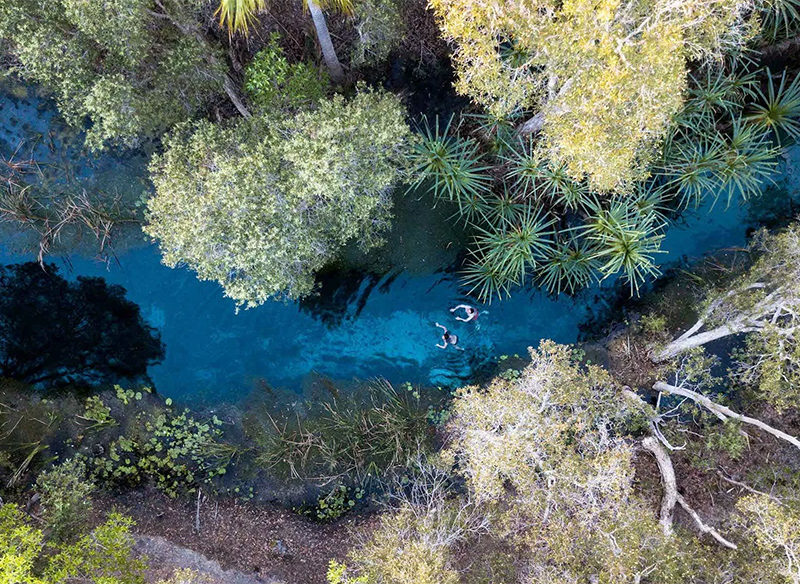 The naturally heated, underground waters of Zebedee Springs converge in multi-tiered rock pools amidst a forest of huge native palms at the Kimberley’s El Questro Station. You’ll need to stay at the El Questro Homestead for exclusive use (after 12pm), or else get there early so you can lie back in your own private pool, gaze at the canopy overhead, listen to water tumbling through the gorge and unwind in nature’s beauty. $10 per person.